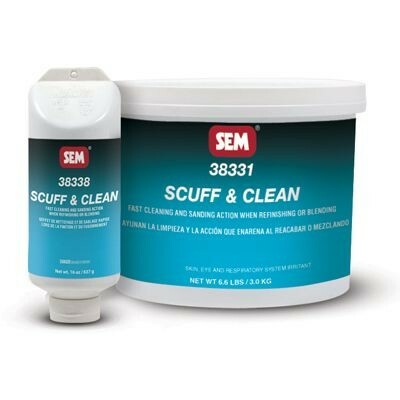 SEM Scuff & Clean is formulated for cleaning and scuffing panels when refinishing or blending. Excellent vertical hold allows the surface to be easily cleaned and rinsed while leaving a uniform fine scratch. It breaks down contamination and floats it away while preparing the surface for proper adhesion of repair and refinish materials. Prepares bumpers or panels when refinishing or blending. It's abrasive action improves adhesion of repair and refinishing materials. Features: Excellent abrasive action, VOC compliant and environmentally safe, saves time and labor and easy to use squeeze tube.